NASHVILLE, Tenn. - July 10, 2018 - PRLog -- Blood and Wisdom by Verlin Darrow is now available nationwide. Published by Wild Rose Press, Blood and Wisdom is published in trade paper (ISBN: 978-1-5092-2086-1, $17.99) and eBook (ISBN: 978-1-5092-2087-8, $5.99) editions. Blood and Wisdom is available wherever fine books are sold. 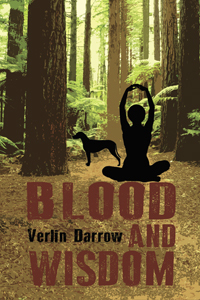 Novelist Verlin Darrow puts a fresh spin on the classic PI novel in Blood and Wisdom, a swiftly-paced, suspenseful, seamlessly plotted tale. Protagonist Karl Gatlin, a psychological-minded PI, finds himself in highly unusual—and highly dangerous—circumstances when he falls in love with a spiritual-minded client. About Blood and Wisdom: When Private Investigator Karl Gatlin takes on Aria Piper's case, it was no more than a threat—phone calls warning Aria to either "stop doing Satan's work" or meet an untimely demise. But a few hours later, a headless John Doe bobs up in the wishing well at Aria's New Age spiritual center near Santa Cruz. Aria had ideas about who could be harassing her, but the appearance of a dismembered body makes for a real game changer. And what Karl Gatlin initially thought was a fairly innocuous case turns out to be anything but. Dispatching former rugby superstar and Maori friend John Ratu to protect Aria, Karl and his hacker assistant Matt are free to investigate a ruthless pastor, a money launderer on the run, some sketchy members of Aria's flock, and warring drug gangs. With his dog Larry as a wingman, Karl uncovers a broad swath of corruption, identity theft, blackmail, and more murders. But nothing is as it seems, and as the investigation heats up, Karl is framed, chased, and forced to dive into the freezing water of the Monterey Bay to escape a sniper. Blood and Wisdom has garnered high advance praise. According to Richard House, MD, author of Between Now and When, "Darrow has a sense of plot and style that carries the reader forward into that special place of anxious expectation, the place where putting the book down is unthinkable. Fascinating." C.I. Dennis, author of the Vince Tanzi series, including Tanzi's Luck, praises Blood and Wisdom for its "great pace, fun characters who you care about, plenty of twists, and narrative personality." The Wild Rose Press (www.thewildrosepress.com) is an independent fiction publisher based in New York.